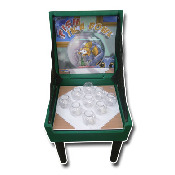 This Fish-in-a-Bowl carnival game is a great toss game that will keep the people coming back over and over again. Toss ping pong balls and try to get them in the fish bowls. Comes with 3 ping pong balls.